I have to admit a certain bias on this question of museums and fun. Off the top, I cannot recollect reading a museum mission statement that includes the word fun However, a recent blog post by Reach Advisors takes up this issue. They note that fun as a desirable attribute of a museum visit is often a generational issue – disfavored by those over 50, but favored by younger visitors. The Reach survey also notes that parents consider the fun their children have in museums as a means for learning. The Reach blog post assesses views on both the intrinsic and extrinsic motivations for fun in museums. Part of this might be how one conceptualizes fun. I always thought of the mind bending linguistic midterms of Dr. Joe Fred Foster during my undergraduate days at the University of Cincinnati as fun. Most of my cohort considered the tests torture. My granddaughter thinks the grocery store at the Memphis Children’s Museum is a blast and I see it as an early indoctrination into the consumerism of name brand over packaged stuff that ultimately ends up in land fills. Over the past couple of weeks at the C.H. Nash Museum at Chucalissa we have had a new kind of fun. We recently developed a hands-on program where students grades 5 and up work in pairs and are led through a process where they examine a selection of ten prehistoric stone tools ranging from scrapers to dart points to ground stone. The project leader asks the students to consider why the flint used is of different colors (trade & exchange), size and shape (function), basal notching or stemmed (style), and always including the caveat that the “experts” don’t have good answers to some of these questions. The program is tied to curriculum standards of the tri-state public school system. The program is a fantastic learning experience and goes well beyond hands-on for the sake of hands-on and was designed to maximize the participatory experience. But, is this new program fun? Our focus group and trial tests would suggest that yes, the program is engaging, stimulates curiosity, captures the imagination, and so forth. If I transported myself back nearly 50 years to a 10-year-old me, I am confident I would call the program fun. 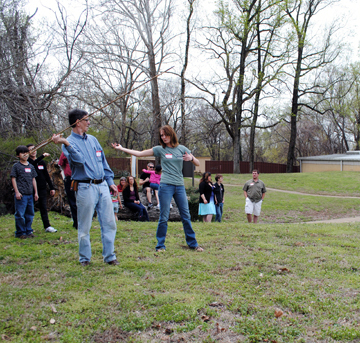 We end the new stone tool program with an opportunity for the participants to go outside and use an atlatl to throw darts. We make mention of how this was a primary hunting method prior to the introduction of the bow and arrow in the Southeast U.S. around AD 700. 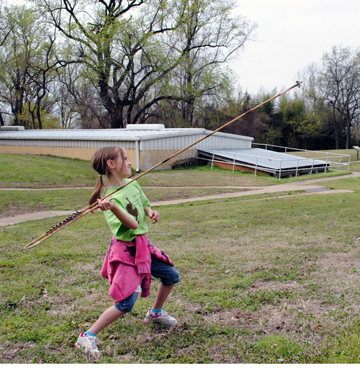 Throwing six-foot long darts with an atlatl is fun. This past Saturday, volunteers and site visitors stayed outside for two hours throwing the darts, well beyond the planned 20 minute initial demonstration and throwing opportunity. Natalye Tate, one of our graduate assistants takes the lead in these demonstrations. She currently holds the distance record at the museum (in the historic era anyway) and provides an excellent role model for young girls in what is typically considered a manly exercise. I have suggested that given a choice between throwing darts with an atlatl or playing on digital touch tables, visitors would most often choose the atlatl. Is it because this is more fun? more educational? a unique opportunity? or all the above? What are your thoughts on having “fun” at museums? I most definatly agree with you, Robert. Museums should be fun. IN fact, museums should be an institution where we can show that LEARNING can be fun. 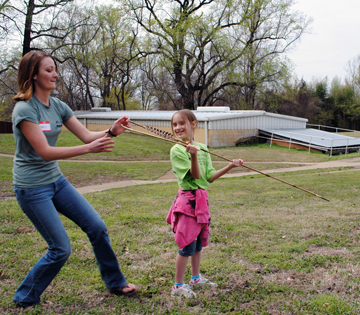 BTW, I love your atlatl activity.